A fun and foolproof cookbook for people who think they can't cook. 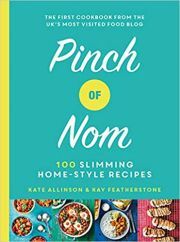 Find out how to cook 80+ quick and easy recipes with this hilarious new cookbook from TV presenters and "middle-aged YouTube sensations" Nadia Sawalha and Kaye Adams. Is your rice overcooked? Are your family rude about your cooking? Do you think people who bake cakes come from a different species? Inspired by the duo's hit YouTube series, which was borne out of MasterChef-winner Nadia's frustration with her best friend Kaye's kitchen mishaps, Nadia & Kaye Disaster Chef is a recipe book for the culinary-challenged who want to be able to dish up delicious grub fast and with no hassle. Nadia shows Kaye how to cook family meals such as paella, chowder, and meatballs. Follow her simple steps for yourself and you can sit down on Sunday to a perfect roast dinner, or whip up a pavlova or Victoria sponge for friends and family. Each recipe comes with a cast-iron guarantee: "If Kaye can cook it, you can cook it". The warm and hilarious chemistry between these two best friends leaps from every page, with anecdotes, tricks and kitchen hacks dotted throughout. Nadia and Kaye want Disaster Chefs everywhere to know that help is on the way, and to reassure Kaye's children that they need no longer panic when they hear those three little words "Dinner is ready".